REAL MADRID and the UEFA Champions League are indelibly linked and always will be. Twelve times winners of the competition – in its various guises – Real will, for the time being at least, hold a trump card over their national and international rivals, Barcelona. The fact that around half of those 12 victories were achieved before Barcelona had not allowed regional priorities to cloud their judgement says plenty about the determination of Real to become Europe’s first dominant force. It has as much to do with politics as it has with the game itself. The idea of a pan-European competition had first been mooted in the 1920s, but the lack of the right infrastructure to support such a venture was a major hurdle. While some countries were technologically advanced, many did not have the mass industrialisation of Britain or Germany. As the 1920s became the 1930s, and Europe recovered from depression, nationalism – perhaps born out of protectionism – swept across the region. The Mitropa Cup was introduced in 1927, involving – as the name suggests – countries from central Europe. This, no doubt, contributed to the advanced state of football in Austria, Czechoslavakia and Hungary during this period. If the European Cup had been formulated during this era, it is likely that it would have been won by a team like Rapid Vienna, Ferencvaros or Sparta Prague. In the aftermath of the second world war, sport was seen as a unifying agent as much as it was an expression of nationalist vigour. While the Mitropa never scaled the heights it had achieved in the 1920s and 1930s, it returned and also pointed the way for other competitions. More than any other, the Latin Cup showed what could be achieved. This involved the top clubs from France, Italy, Portugal and Spain. It was no coincidence that when the European Cup finally emerged in 1955, clubs from these nations set the pace. Real Madrid were not Spain’s most successful club before the 1950s. They had won La Liga just twice, in 1931-32 and 1932-33. The league had been formed in 1929 but it was the Basque club, Athletic Bilbao that were the dominant force. The club lost its “Real” tag when the second Spanish Republic was formed in 1931, becoming merely Madrid Football Club. General Franco later resinstated the club’s “royal” status. After the war, Real were in decline, finishing as low as 11th in La Liga. At the same time, Spain had become somewhat isolated, with many countries breaking off diplomatic relations. Under Franco, Spain was not a member of the United Nations and had pursued a strategy of economic self-sufficiency with no foreign trade or investment. By the early 1950s, it was clear that Franco’s policies had failed and Spain’s economy was on the verge of collapse. Franco started to liberalise the financial system and promote tourism, in what many observers called “The Spanish Miracle”. Spain, in the 1960s, enjoyed prosperity, boosted by the growing urbanisation of the population and a massive influx of holiday-makers. Real Madrid’s own renaissance preceded this economic rebirth, but gathered momentum as Spain sought to become integrated with the international community once more. The club’s success in the late 1950s owed much to the influx of top-level overseas talent. Of the 36 players that played in their five European finals, eight were foreign. Santiago Bernabeu, the club’s president, pursued and secured the Argentinian Alfredo Di Stefano in 1953, signing him from Colombian side Millonarios, the club that became outlawed by FIFA for signing international players without authority. Bernabeu also built the huge stadium that would eventually bear his name, largely from public subscription, and embarked on a programme of signing more top-class foreign players. Di Stefano was the key acquisition, however, transforming Real Madrid into a title-winning team playing in front of massive crowds. Bernabeu was among the first football impresarios to recognise the economic potential of the sport. In the 1940s, Real’s home held just 16,000 but Bernabeu had plans to develop the club’s new stadium to host up to 200,000 people. The club’s detractors will tell you that Bernabeu and Franco were closely linked. That Real Madrid failed to win La Liga in Franco’s first 15 years in power disproves the theory that the Spanish dictator made sure Real were successful. It is true that Real enjoyed the backing of the monied upper classes and the club benefitted from special permits to acquire overseas players, but whether Franco continually poured favours upon the club is questionable. Strangely, the first seven European Cups were won by teams from the capital city of a totalitarian state – Real’s five were followed by two from Lisbon’s Benfica. It would be nice to think, though, that it was the sheer talent of the players lured to Madrid by Bernabeu – “a star a year” – that elevated Real to exalted status. Di Stefano’s striking partner in that first European Cup-winning season was the Uruguayan Hector Rial. A year later, Real signed French star Raymond Kopa, who had played against them in the 1956 final, and Uruguayan defender Jose Santamaria. Then in 1959, Bernabeu realised his team needed some fresh impetus and a new star name and took a gamble on an overweight and apparently ageing Ferenc Puskas, who had not kicked a ball for some 18 months. Real’s resurgence really began when they won La Liga in 1954 and 1955. After Gabriel Hanot’s idea for a European Cup took root, Real were invited to take part, regardless of whether they were Spanish champions or not – an early hint at what the UEFA Champions League would become. Bernabeu, a fierce advocate of the concept from the early stages of discussion, was named as a member of the committee. While Real embraced the concept, their rivals were more concerned with re-establishing a Catalan championship. Franco, allegedly, also saw it as a way to remove the pariah status that had stuck to the nation after the war. Real could be standard bearers for a new Spain. Fernando Maria Castiella, Franco’s foreign minister at the time, called Real Madrid “the best embassy we ever had”. The regime soon realised the political currency of a set of white-shirted, sporting ambassadors. Historians often consider that, for Spain, there were three major landmarks of the decade between 1950 and 1960: the signing of the concordat with the Vatican; the pact with the US; and the five European Cups won by Real Madrid. The impact on the continent cannot be over-estimated, for Real became almost as important to European unity as the 1957-formed European Common Market (Spain didn’t join the community until 1986). 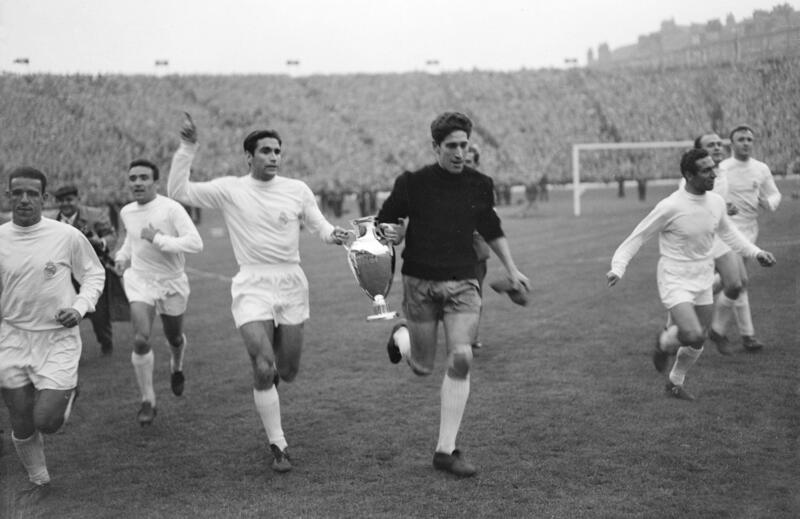 And it was Real’s exhilarating European Cup win in 1960 that inspired the launch of World Soccer magazine. It cannot be assumed that Real were invincible, however. In 1955-56, they marched past Servette of Switzerland, Partizan Belgrade of Yugoslavia, AC Milan and then beat the French champions, Reims by 4-3. But in Spain, Real ended in third place, 10 points behind Bilbao. Real regained their crown in Europe and also returned to the top of La Liga in 1956-57 and in 1957-58, they repeated the trick. They won two more European Cups in 1959 and 1960 but in 1959-60, were runners-up in Spain, both times coming in behind Barcelona. Real’s brilliance culminated in that famous 7-3 win against Eintracht Frankfurt in Glasgow in 1960. Real would never be as dominant again. In 1963, the Spanish football authorities restricted the use of foreigners and, coincidentally, Real’s golden era was over. The question is, did Real Madrid develop a system that was more ideally suited for European competition, but was not quite as all-conquering at home? Between 1956 and 1961, Real won three of six La Liga titles, a handsome haul by anyone’s standards, but towards the end of the five years, a brilliant Barcelona side overtook them in Spain. Real were virtually unbeatable on their own ground during this period. Between 1955-56 and 1960-61, they lost four times in Madrid. Of their 124 wins in La Liga in this timeframe, 54 were by three goals or more and in the last three campaigns (1958-59 to 1960-61), they averaged almost three goals per game. The Spanish national team did not feel the full benefit of Real’s success, despite players like Puskas, Di Stefano and Barcelona’s Luis Kubala being “naturalised”. In 1954 and 1958, Spain failed to qualify for the World Cup. In the 1960 European Championship, Spain withdrew in the quarter-finals after being drawn to face the Soviet Union. Real Madrid, although having star overseas players, were still predominantly Spanish. With such a powerful team winning the European Cup, it is perhaps surprising that this did not translate into success, although in 1964 as host nation, Spain won the second Nations Cup. It is arguable that the Spanish league was stronger than most of the opponents Real were facing in European competition. If you consider the year-by-year opponents, AC Milan, Manchester United and Reims were difficult, but teams like Servette, Nice, Sevilla, Antwerp, Wiener SC and Jeunesse Esch were often tantamount to cannon fodder. Real were more advanced and arguably fitter than most, but was there anything revolutionary about their tactics or was it just pure skill and speed that overawed opponents? Bobby Charlton of Manchester United, recalling his team’s European Cup meetings with Real, said they appeared to be “out of this world”, although Brian Glanville summed them up in 2011 as something of a “one man team” during their five-year reign – and that one man was Di Stefano, “a remarkable mix of arrogance and selflessness”. Real Madrid were all about the players, and of course, Santiago Bernabeu. You struggle to name the coach of Real Madrid in each of their five European Cup winning seasons. In fact, over the course of the period, Real had a series of coaches. The first was Jose Villalonga Llorente, just 36 years of age when Real won their first European Cup. He left after two triumphs, moving to Atletico Madrid in 1959. Luis Carniglia, an Argentinian who had previously managed Nice in France, lasted two seasons before being sacked by Bernabeu after he left Puskas out of the 1959 final. Carniglia, who was reluctant to play the less-than-fully-fit Hungarian, was replaced by Miguel Munoz and the club’s former skipper – and scorer of their first ever European Cup goal – stayed until 1974. Munoz’s spell in charge straddled the period either side of Spain’s ban on footballing imports. That came in 1963 as Spain continued to punch below their weight. While this did little to dent Real’s domestic superiority initially, towards the end of the decade-long ban, Real had dropped from their pedestal and finished fourth three times in four years. In Europe, however, Real had certainly fallen from their lofty heights. In the mid-1960s, the more defence-minded Italians came to the fore, which also coincided with the retirement of Di Stefano and in 1966, Puskas. The likes of Inter and AC Milan represents a hard-edged modernity that was the very antithesis of the team that charmed the continent. The reign of Real had its last hurrah in 1966, but then they were beaten in the European Cup by the likes of Manchester United, Rapid Vienna and Standard Liege, the latter two the type of team they would easily have disposed of in their pomp. It would be many years before they would return to the pinnacle of the game. They had done enough to secure their place in football’s pantheon as European football’s first super club. They may have been caught up by other clubs, but they are among the elite band that can be called global football brands. And it really all started with that first European Cup. Reblogged this on A Football Manager's Lounge.